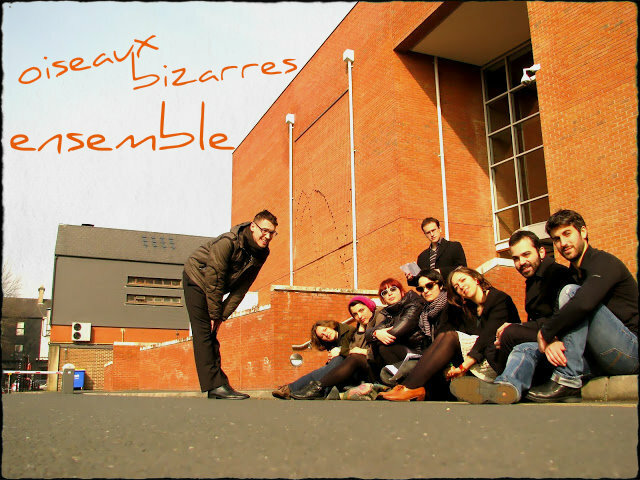 Oiseaux Bizarres is an ensemble that consists of musicians and performers, all with postgraduate or PhD studies, based in London, Amsterdam, Berlin, Barcelona, Thessaloniki and Canberra. The challenge of performing Jani Christou’s late works, with all the difficulties they present to musicians, has been Andriana Minou’s research and practice interest since she was still rather young; she was first brought in contact with Christou’s music through her piano teacher, Nelli Semitekolo, who was one of the composer’s closest friends and collaborators. After an MA in Performing Arts, she had the chance to complete her PhD on Jani Christou’s Anaparastasis III: The Pianist and Epicycle at Goldsmiths, University of London with the support of the Onassis Public Benefit Foundation. While working for her PhD, she did extensive research at the Jani Christou Archive in Athens and also contacted many of Christou’s friends and collaborators. One of them, Theodor Antoniou (the conductor at the premiere of Anaparastasis III), congratulated her on the ensemble’s fine and hard work after watching her final PhD performance. Andriana initially formed the Oiseaux Bizarres ensemble for the purposes of her PhD upgrade and final performances, by carefully selecting collaborators of the highest musical or performance training, who were also prepared to take risks and expand their performance abilities as well as shared the same interest in Christou’s musical performance philosophy. Their common passion for the ground-breaking musical concepts of Christou has kept the ensemble together and motivated them to perform Christou’s music as much as possible and anywhere possible. For instance, Amsterdam-based composer and performer, Thanasis Deligiannis (one of the main members of the ensemble), has also undertaken research on Christou and has performed Anaparastasis I: The Baritone in Greece and the Netherlands, and composes works which could be regarded as an evolution of Christou’s unique concepts. One could therefore regard the members of the Oiseaux Bizarres ensemble as highly specialised on the subject of Jani Christou. Our main objective is to bring Jani Christou’s music back to the concert halls, on the same level with new music, as we believe that his late works can remain “new” and relevant even forty years after his death, anywhere in the world and within any context; Christou’s works leave space for “contemporary” interpretations without losing their distinct quality and content, as long as their purely practical aspect is informed by their rich philosophical background; the way they address the audience is often surprisingly immediate. Christou’s final works are very fine pieces of musical performance that can become fragile when handled without the sensitivity and the knowledge that our ensemble always tries to bring into our performances. This is perhaps one of the reasons why musicians – even in Christou’s country of origin – are reluctant in performing them. The success of our previous performances, however, has proven that the way contemporary audiences relate to these works is exceptionally powerful, as long as they are not performed like rigidly over-stylised (and sterilised) museum samples from the 1960’s. A noteworthy example is the fact that Anaparastasis III was the oldest piece performed in Sonorities Festival 2012, amongst various new pieces of electronic and electroacoustic music; however, its performance seemed to have the strongest impact on an audience that was primarily concerned with the latest tendencies in the field of new music. We aim at offering an intense musical performance experience to the audience of this conference, as we already did at Goldsmiths, University of London and Sonorities Festival, Belfast in 2010 and 2012 respectively.